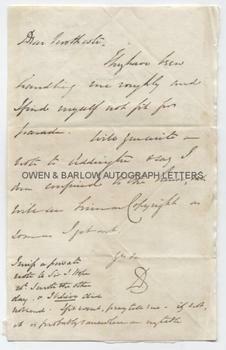 JAMES BROUN-RAMSAY, 1ST MARQUESS DALHOUSIE autograph Letter Signed. British (Scottish) colonial administrator. Governor-General of India (1848-1856). ALS. (signed with initials). 1p. [no place] Nov 25th [no year]. To [Sir Stafford] Northcote. "They have been handling me roughly and I find myself not fit for parade. Will you write a letter to Addington and say that I am confined to the house, but will see him on Copyright as soon as I get out." With the post-script "I miss a private note to Sir J. Hope, which I wrote the other day and which I believe I did not send. If it went, pray tell me - if not, it is probably somewhere on my table". 8vo. Approx 7.25 x 4.5 inches. Possibly lacking an integral blank leaf but this may have been torn off by Dalhousie himself, as the verso has been folded to make the letter cover and is addressed by Dalhousie to S.H. Northcote, B[oar]d of Trade, and initialled by him in lower left corner. With remains of old paper backing on verso with mounting traces. A few slight creases. Very good. Lord Dalhousie consolidated the control of the East India Company in India and served as India's Governor-General from 1848 to 1856. Prior to the Raj period, this was the equivalent of the role later exercised in India by the Viceroy. He commanded during the Second Sikh War and the Burmese War. He is said to have viewed himself and to have acted as India's monarch and during his tenure he seized the Indian state of Punjab and also annexed other Princely States such as Jhansi (under the controversial 'doctrine of lapse'). His aim was to reform and anglicise India but his policies were seen by many to have been over-confident and reckless and to have laid the foundations for the Indian Mutiny of 1857.